Inspired, but not copied... Just the way we like it. I'm definitely Team Givenchy on this one, by the way. Get the Givenchy 'Obsedia' bag a.k.a. € 1,165 HERE. Get the Zara version a.k.a. € 49,95 HERE. ik ben ook wel iets meer pro Givenchy! bijna niets van verschil. zara dus! Loving the givenchy one but for practical reasons, Zara one! I'm team Givenchy too, I think this alternative is disappointing. The Proenza Schouler alternative by Zara is much better. 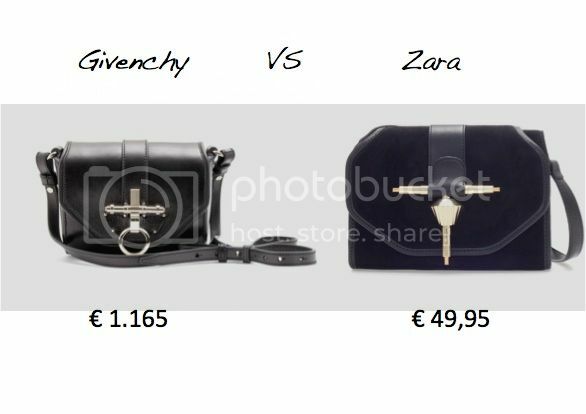 Ik vind die van Givenchy ook een stuk mooier, maar om nu meer dan 1000 uit te geven voor zo'n kleine tas. Hello there my dear! maybe we could follow each other on Bloglovin and/or GFC, Facebook? Love bag Zara! Nice and good price!!! Either they are imitated or not, I think it is a good solution for anyone who wants to buy cost effective products.Thank for sharing with us.